German earth geodetic satellite. 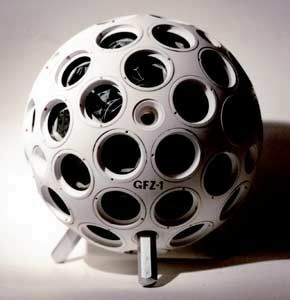 GFZ-1 was a geodetic satellite designed to improve the current knowledge of the Earth's gravity field. Geodesy satellite built by Kayser-Threde, Institute of Space Device Engineering - Moscow for GFZ, Germany. Launched 1995. AKA: Geo Forschungs Zentrum;WESTPAC. Status: Operational 1995. First Launch: 1995-04-19. Last Launch: 1998-07-10. Number: 2 . Gross mass: 22 kg (48 lb). Height: 0.21 m (0.68 ft). The satellite, a passive system with no onboard sensors or electronics, was covered with retroreflectors that reflect laser beams sent from ground stations. By measuring the round trip time of the transmitted light, the distance between the satellite and the station could be determined within approximately 1 centimeter. These measurements were used to determine variations in the rotational characteristics of the Earth and for measurement of the Earth's gravitational field. As the vehicle's orbit decayed, the satellite's orbital motion would also be used calculate to atmospheric densities. Deployed from the Mir space station, GFZ-1 was the first non-Russian satellite launched from Mir. GFZ-1 was developed in under 12 months and cost approximately $700,000 (including design, fabrication, test, and launch). Data collection, distribution and evaluation were coordinated by the project's scientists at the GeoForschungsZentrum Potsdam. he satellite consisted of a spherical body made of brass with 60 corner cube reflectors distributed regularly over the satellite's surface. These retroreflectors were quartz prisms placed in special holders that were recessed in the satellite's body. External metallic surfaces were covered with white paint for thermal control purposes and to facilitate visual observation in space. The vehicle's size was limited by the maximum allowable dimensions of the Mir airlock (30 cm). The vehicle carried no electronics or sensors and was not attitude controlled. The spacecraft carried no active payload. Science was performed using ground lasers to illuminate the vehicle's 60 retroreflectors. GFZ-1 was delivered to Mir on Progress M-27 and deployed from Mir on 19 April 1995. Family: Earth, Earth geodetic sat, Medium earth orbit. Country: Germany. Spacecraft: Mir. Launch Vehicles: R-7, Soyuz-U, Soyuz-U-PVB, Zenit-2. Launch Sites: Baikonur, Baikonur LC1, Baikonur LC45/1. Agency: GFZ, Kayser-Threde. Bibliography: 2, 6. GFZ-1 - . Mass: 20 kg (44 lb). Nation: Germany. Agency: GFZ. Program: Mir. Class: Earth. Type: Geodetic satellite. Flight: Soyuz TM-21. Spacecraft: GFZ-1. Decay Date: 1999-06-23 . USAF Sat Cat: 23558 . COSPAR: 1986-017JE. Apogee: 387 km (240 mi). Perigee: 380 km (230 mi). Inclination: 51.60 deg. Geodetic; carried retroreflectors for ground laser ranging; delivered to Mir on Progress M-27 and deployed from Mir 4/19/95 ..
1998 July 10 - . 06:30 GMT - . Launch Site: Baikonur. Launch Complex: Baikonur LC45/1. LV Family: Zenit. Launch Vehicle: Zenit-2. WESTPAC - . Mass: 24 kg (52 lb). Nation: Australia. Agency: WPLTN. Manufacturer: EOS, RKA. Class: Earth. Type: Geodetic satellite. Spacecraft: GFZ-1. USAF Sat Cat: 25398 . 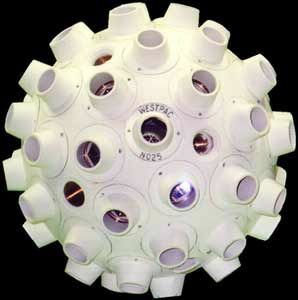 COSPAR: 1998-043E. Apogee: 819 km (508 mi). Perigee: 815 km (506 mi). Inclination: 98.80 deg. Period: 101.20 min. Formerly known as WPLTN-1, this geodesy satellite was a copy of Potsdam's GFZ-1 satellite, a sphere covered with laser retroreflectors, with a different `Fizeau' corner cube design. It serves as a target for the Western Pacific Laser Tracking Network (WPLTN) and is a joint project of Electro Optic Systems of Queanbeyan, New South Wales, Australia, and the Russian Space Agency. Diameter is 0.24m.